The past two seasons had been forgettable ones for the D-backs, with Arizona sputtering to consecutive last places finishes in 2009 and ‘10. They fell victim to high strikeout totals and a lackluster bullpen, with the postseason being a distant thought. Things have taken a drastic change in 2011. It was a misty June afternoon as Ian Kennedy approached the tee box, taking a couple of practice swings before driving his ball down the middle of the fairway. Daniel Hudson followed, splitting the same fairway with his tee shot. The two, along with fellow starter Joe Saunders, were playing the 95-year-old Oakland Hills Country Club course during an off-day on the D-backs’ road trip to Michigan during Interleague play. 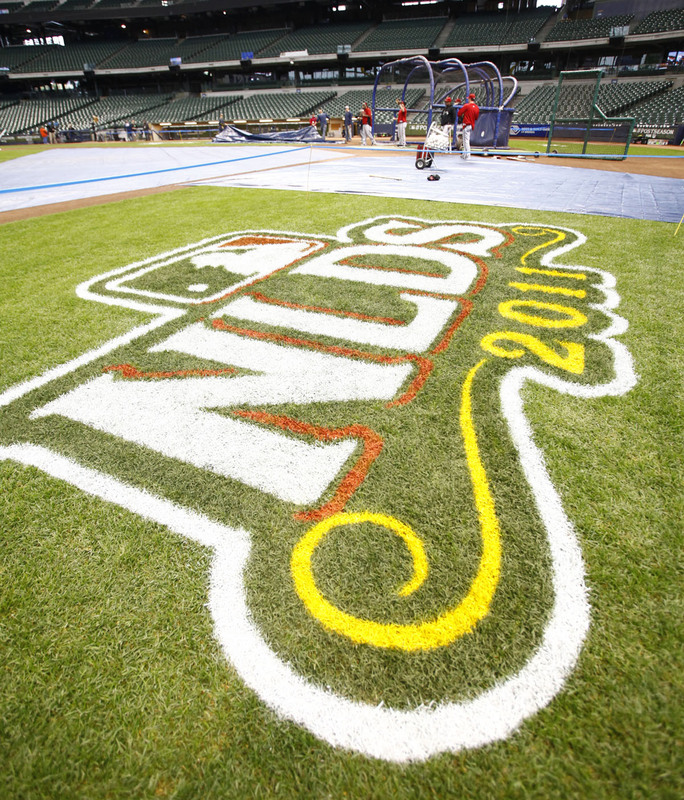 For the first time since 2009, the D-backs have not one, but two All-Star representatives at the Midsummer Classic. Right fielder Justin Upton and catcher Miguel Montero were both selected as reserves on Bruce Bochy’s National League squad. The D-backs picked up their first series win of the season, taking two out of three against the defending NL Central Champs, the Cincinnati Reds. With a full count and two outs, Chris Young hit a three-run, go-ahead home run off Reds reliever Nick Masset in the bottom of the eighth inning. The D-backs trailed 5-1 early, but Stephen Drew got things going with a ground-rule double in the third, and then the team broke things open with a five-run sixth. Ryan Roberts provided the big hit in that frame, launching a three-run homer to left-center field to cap off a five-run sixth inning that gave the D-backs their first lead of the game. Roberts grabbed one of the final roster spots after staying red hot through Spring Training while fellow utility infielder Geoff Blum had an injury that necessitated a DL stint. Roberts has taken advantage of the opportunity, going deep twice and reaching base safely seven times in his first five games. On Saturday night, Daniel Hudson bounced back from a shaky first inning to hurl seven solid innings in his first home start of 2011. The Reds managed to put two runs on the board in the opening frame, but that’s all they would muster through the rest of his outing. Hudson cruised, allowing only one hit after the first inning. He set the Reds down in order in the second, fourth, sixth and seventh innings. Hudson went out with a bang in the seventh, striking out Jonny Gomes, Jay Bruce and Ryan Hanigan. “(I was) really getting locked in with my arm slot. Staying on top of the ball and driving down hill is the biggest adjustment I had to make,” Hudson said. In his seven innings of work, Hudson scattered three hits, allowed just two runs, and struck out eight batters. He even lined a single to left field in a fifth inning at-bat, giving Hudson a three-game hitting streak. Saturday’s outing was Hudson’s 13th consecutive quality start, which tied him with Brandon Webb and Randy Johnson for third place all time. In the D-backs’ second home game of the season, newcomer Russell Branyan received the starting nod at first base on Saturday. It was his second start of the season, the other being against the Cubs on April 4. The slugger won a roster spot after an outstanding Spring Training performance. That hot hitting has carried into the regular season as he raised his average to .444 with two more hits on Saturday. Branyan flashed the leather in the opening inning when he corralled a Chris Young throw with the bases loaded and one out, then quickly gunned out Jonny Gomes at third base for the double play. In the ninth, Branyan hauled in a line drive off the bat of Drew Stubbs and stepped on first base to turn the unassisted double play. In his second at-bat, Branyan rocketed a stand up double off the right field wall, his first of the season. Later in the eighth, Branyan smacked a 102 mph fastball from Reds pitcher Aroldis Chapman into left field for a single. With his single to center field in the fourth inning Saturday night, Miguel Montero extended his season opening-hitting streak to seven games. Montero’s streak is the third-longest season opening streak in team history. Montero is off to an incredible start to the season. He collected three hits in yesterday’s home opener, and is now hitting .500 this season. Montero got his first day off Sunday, with Henry Blanco drawing the start. Willie Bloomquist has also strung together a hitting streak to start the season, hitting safely in seven straight games. Miguel Montero has proven to be a force at the plate throughout his first five seasons in the Major Leagues. When he is hot, Montero’s bat can change the complexion of the D-backs lineup. In a St. Patricks’ Day matchup against the Dodgers, Montero was the lightning rod behind the Arizona offense. In the top of the second inning, he laced a single into center field to start a two-out rally. One batter later, Montero crossed home plate on Ryan Roberts’ double off the left field wall. Montero struck again in the fourth inning. After Justin Upton and Russell Branyan reached base, Montero rocketed a Chad Billingsley offering into the right-centerfield gap to plate both runners. As his sixth big league season nears, Montero is starting to find his stroke at the plate. 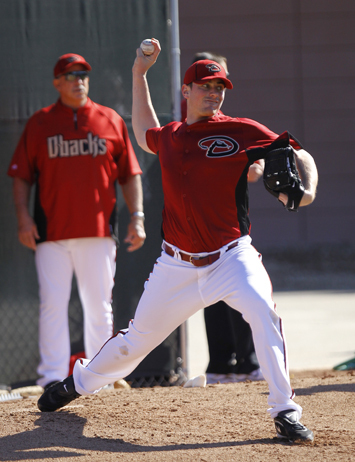 Aaron Heilman entered Spring Training with his sights set on making his way into the D-backs starting rotation. After spending last season as a reliable reliever in the Arizona bullpen, Heilman has done his part to possibly earn a rotation spot. On Thursday, Heilman started against the Dodgers and became the first D-backs pitcher to pitch through five innings this Spring. Heilman cruised through the first inning behind a strikeout and double play. In the second, Heilman struck out Matt Kemp and got James Loney to fly out. The right-hander then shattered Juan Uribe’s bat on an inside pitch to get a groundout and end the inning. Heilman would fight through the next two innings, allowing only Kemp’s two run homer to left. In his fifth and final inning of work, Heilman ended his day on a high note by retiring Andre Ethier and Kemp on fly outs for the first two outs. Loney smacked a single, but that was all for the Dodger offense as Heilman struck out Uribe with ease. Following his longest outing of the Spring, Heilman was pleased with the results. Between the roster players and non-roster invitees, the D-backs knew this Spring would be a time for heavy competition. As Spring Training heads into the final two weeks, the battle for the final roster spots are still yet to be determined. Branyan and Wily Mo Pena have been pleasant surprises this Spring after entering camp on minor league deals. The competition for starting first baseman duties is still in full swing with Juan Miranda, Brandon Allen and Branyan all trying to make their case. The final two spots in the starting rotation are also wide open. Heilman, Armando Galarraga and Barry Enright are vying for inclusion. The strong play of several of these players will force Gibson and his staff to make difficult decisions in the coming weeks. 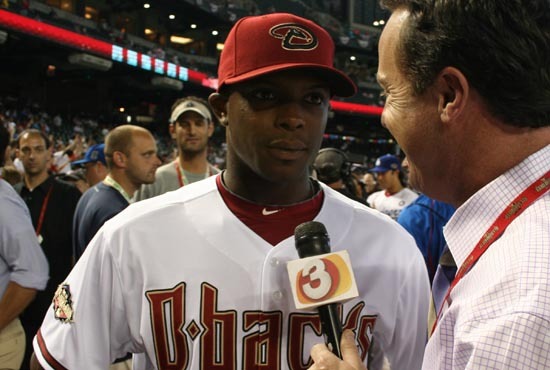 In our continuing quest to bring you as much information as possible on the D-blog, here are some interviews conducted by D-backs Insider writer Greg Dillard at D-backs workouts on Friday. Under an overcast sky in Scottsdale, D-backs pitchers and catchers took to the practice fields at Salt River fields for a variety of workouts on Friday. Spring Training serves as a time to work on the fundamentals of the baseball. Pitchers and catchers devoted time to bunt defense drills, comebacks, pick-offs and much more. On Friday, catchers participated in fundamental drills such as rundown plays. After being acquired by the D-backs from the White Sox last July, pitcher Daniel Hudson was nothing short of dominant on the mound. Hudson came to Arizona and immediately made an impact by posting seven wins, a 1.69 ERA, and striking out 70 batters in his 79 2/3 innings of work. So far this spring, Hudson is enjoying his first spring as a member of the D-backs. After making a bold statement with his performance last year, Hudson is eager to continue his success for all of 2011. Don Baylor has seen it all throughout his lengthy career as a player, manager and coach in the Major Leagues. 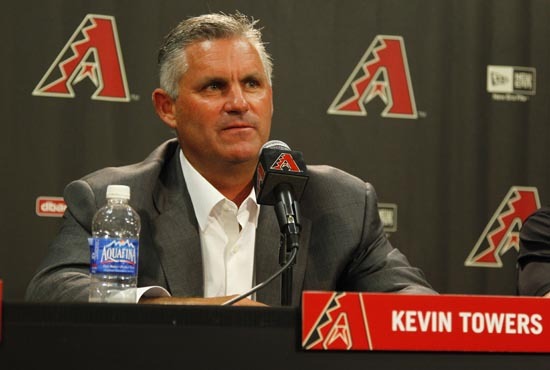 Baylor was hired this past offseason as the new D-backs hitting coach, and is tasked with helping rejuvenate an offense that struck out at a record rate last season. In 2010, Baylor returned to the Colorado Rockies as their hitting coach. Under his watch, the team plated 804 runs which was the second most in the National League. Baylor’s hitters also clubbed 190 home runs. While the first full squad workout is not until Saturday, several position players have been at Salt River fields already. These players ranging from infielders Geoff Blum, Stephen Drew, Kelly Johnson and Willie Bloomquist to outfielders Chris Young and Justin Upton are here working out and getting a head start on their season. Gibson said many of the position players are chomping at the bit to get going. For the first time in the 13-year history of the Arizona Diamondbacks, pitchers and catchers began Spring Training workouts in Scottsdale. There was a new feel and sense of excitement surrounding Salt River Fields at Talking Stick on Monday afternoon as pitchers and catchers moved among the practice fields on day one of Spring Training. 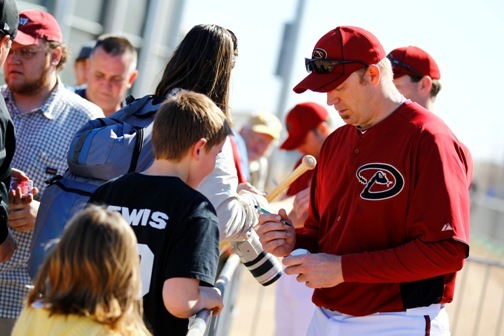 It was a busy day for the D-backs as a clubhouse meeting kicked off the day at 8:30 a.m. The meeting was led by new D-backs skipper Kirk Gibson, and he stressed the importance of competing. “We’re just talking about competing,” Gibson said. “How do we do that? What does it mean to be a pitcher? For me, obviously we want to command the zone with all pitches at any time in the game. We all know that, we focus on that stuff. Fielding your position, being able to control the running game, your sequences, your picks, how to handle the bat. Aside from throwing bullpens, pitchers participated in the usual Spring Training exercises such as bunting and hitting practice, PFP (pitcher’s fielding practice), pickoffs and comebackers. 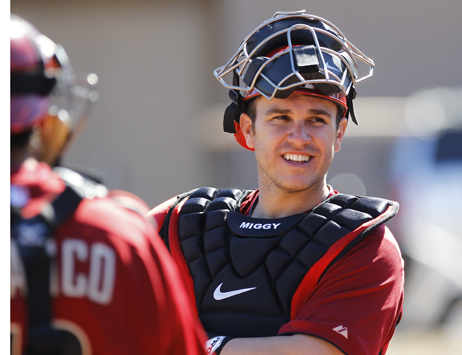 The D-backs catchers not only caught the bullpen sessions, but participated in defense and hitting drills as well. While day one of pitchers and catchers consists of plenty of baseball activities, it is also a chance for the players to meet the new faces and reconnect with the returning faces. Several position players including outfielders Justin Upton, Chris Young and Xavier Nady, along with utility man Willie Bloomquist were spotted around the complex several few days before their report date. The first full squad workout will be on Feb. 19.